One down, eleven to go. Here’s the baby quilt I just finished. It’s for the brother of the boy who got the first soccer baby quilt. Like the two boys share some DNA, these quilts share some of the same fabrics. I’d saved the leftover triangles, some of them already sewn together into squares, from the first quilt and used them as the starting point for the design. I didn’t want the quilts to look exactly the same, so I flipped and twirled the triangles until I had something that worked. I’d bought some new soccer fabrics since I did the first one and mixed those in with the older ones. I didn’t pay as close attention when cutting the fabrics as I should have. This quilt uses fewer prints than I usually work with, so I used up a lot more of each print. I’m used to having a lot of extra fabric and not having to plan how to cut, but that wasn’t the case this time. I ended up having to piece one of the red triangles in the center section, which I wouldn’t have had to do if I’d thought ahead, because I had enough fabric, just not enough to cut into haphazardly. I was able to make the join fairly unobtrusive, and it’s even a little bit cool to have that patchy thing going on, since it harkens back to traditional scrap quilts, but it sure would have saved some time if I’d cut intelligently in the first place. 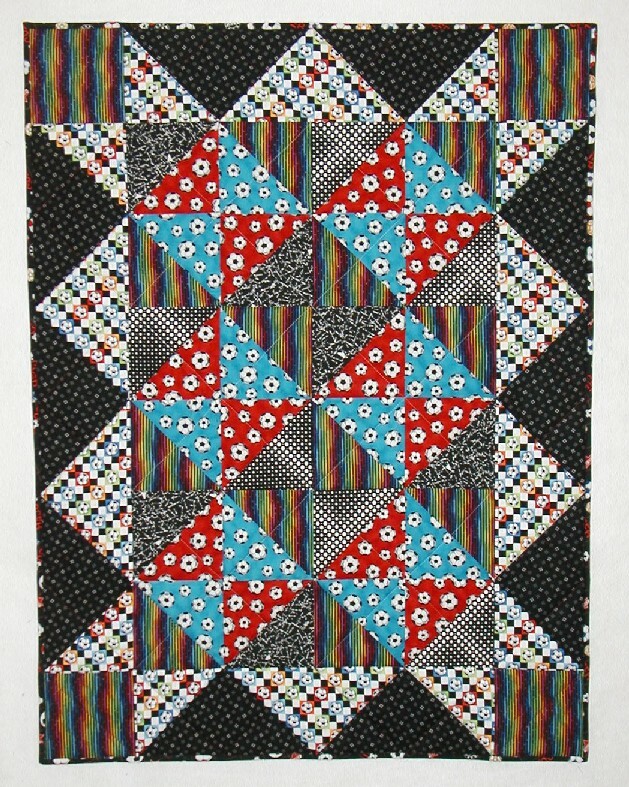 I thought I’d learned from this mistake, since when it came time to cut the triangles from the white print for the border, I reminded myself to pay attention when planning my cuts so that I could get the shadows under the balls all oriented the same, as if the sun were shining from the top of the quilt. I didn’t pay enough attention, though, and cut the strips exactly the wrong way for one set of triangles, so some of the shadows are in the right place and some are not. I am probably the only one who notices little mistakes like this in my work, much less cares about them, but I’d still like to do better on future quilts. I’ve already done a design for the next baby quilt and pulled some fabrics for it. If I stick to the plan, it’ll be a simple rail fence design that should sew up quickly. Once I start cutting the fabrics and putting them up on the wall, they might demand I do something other than what I’ve sketched out. That’s the fun part, seeing what happens between the initial idea and the end product.